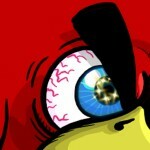 Here is our walkthrough strategy for Angry Birds Rio Treasure Hunt Level 14. The score in the video below is 96,700. However, in this screenshot I had 51780 after the first shot because I also got that bottom right monkey. I finished with 103740 after this shot…But on my current high score of 104560, I had about 43K after the first shot without getting that bottom right monkey. I got lucky and cleared a lot of the top and left stuff for extra points. Second shot same as the video…you want to drop the egg to line up with the slit in the leftmost lily pad and have the egg pop up near the center. @lesleyg, thank you a million times for your hint about where to drop the egg! I was truly struggling with the level until I read your hint. a little bit different as your strat. The bomb not through the monkey, but on the left edge of the cement box, let the bomb fall down , exploded by his own. The score here was 49k , cleared the top and left side total. Second bird same as you described. Maybe not highest score, but well > avg (for now) thusly with two birds, and fairly consistent 95K or above. second bird slightly downward, dropping the egg so that it pops back up and hits the left platform (sometimes with the marmie still on) and diverting up into the central structure. now that I’ve seen some angry advising, I’ll give that another shot. I have a few hours to wait until L-15 opens up anyway, and a lunch break coming on. 2 birder just as @lesleyg described, THANK-YOU! congrats on a puppy @realfish. Has anybody noticed that everyones mention name says @1? @kathy brought it up to me.